Hello, friends! 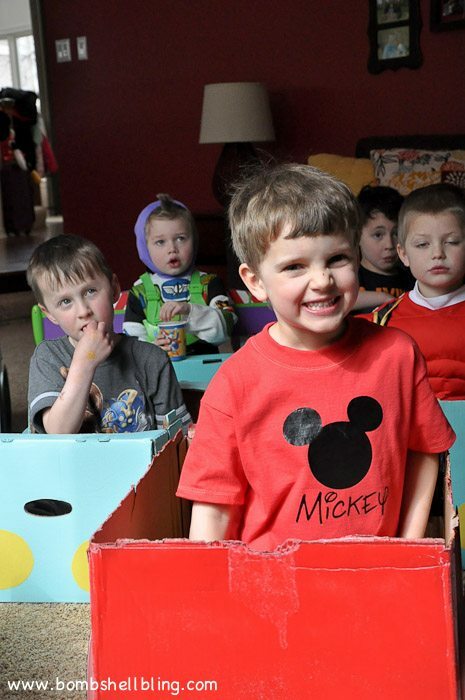 Welcome to Disney Week here on Bombshell Bling! 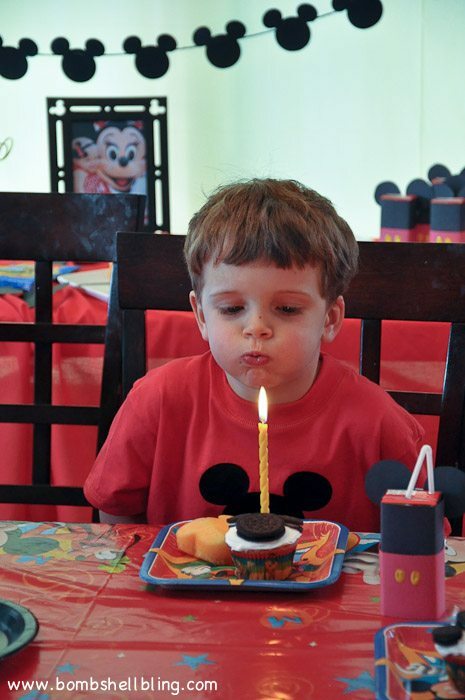 I want to share with you the Mickey Mouse t-shirt that I made for my boy to wear at his “Show Your DisneySide” birthday party. It took about five minutes flat. Seriously. Iron-on vinyl is the bomb dot com. For real. 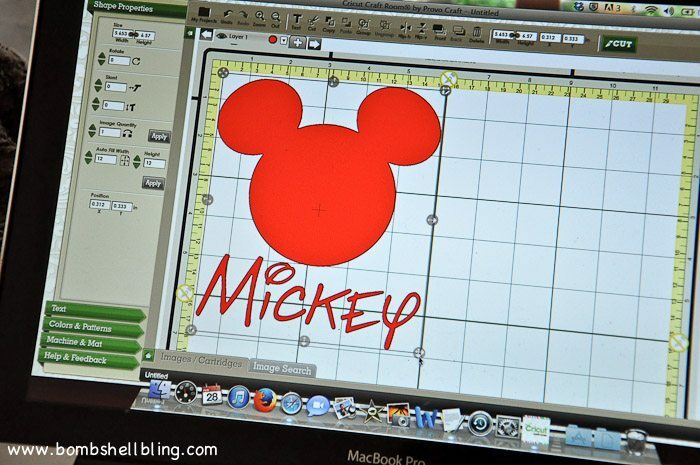 To make your own Mickey Mouse t-shirt you will need a plain t-shirt (I always get mine at Walmart), some black iron-on vinyl, and a way to cut out the Mouse Ear shape. I used my Cricut Expression with the Mickey & Friends cartridge. 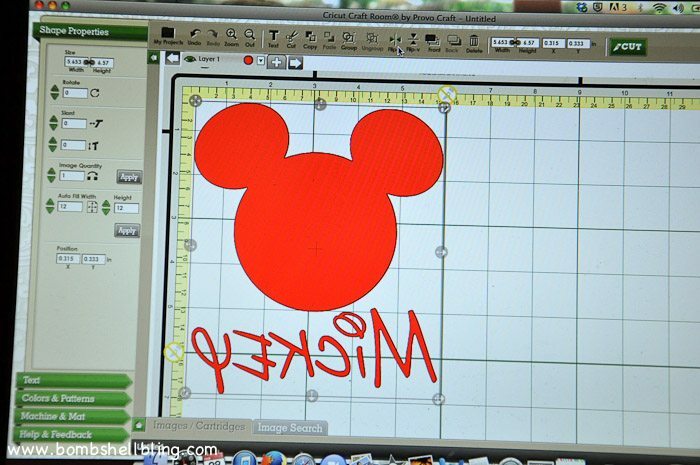 If you do not have a die cutting machine you could do a google image search for Mickey Mouse ears and just trace and cut it onto your vinyl with scissors. 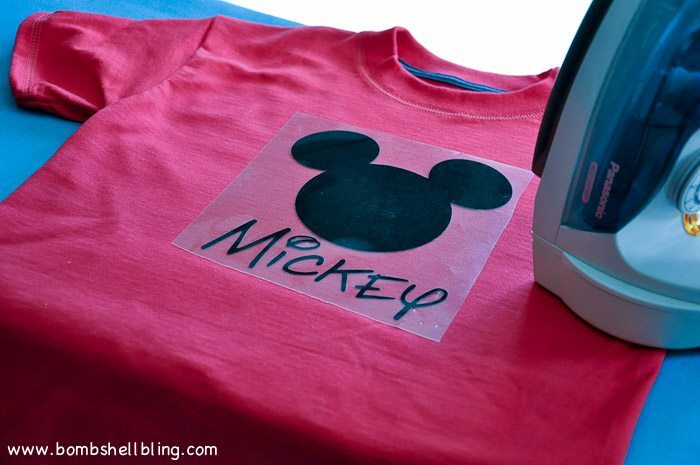 Let me show you how I made my son’s Mickey Mouse t-shirt. 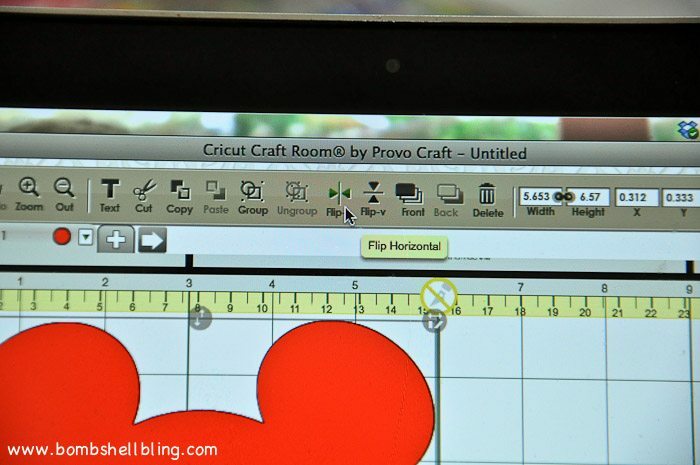 I started by using the Mickey & Friends cartridge in Cricut Craft Room. 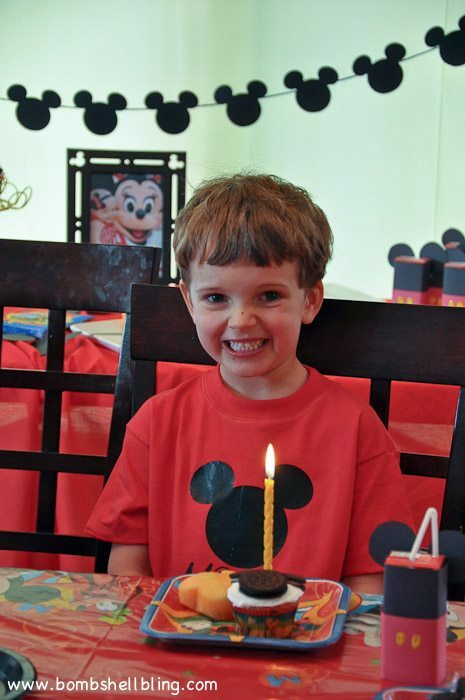 I measured my son’s shirt to determine how wide I wanted the Mouse Ears to be, and then I chose the appropriate shape. Once it has been chosen it appears on your “mat” and you can move it and drag it to be the right size. Next I grabbed the word “Mickey” from the same cartridge and adjusted the size and spacing to be just where I wanted them to be. This is a very important part of using Iron-on vinyl: FLIP THE IMAGE!!!! First select the whole image, and then “Flip” it so that when you iron on the word it won’t be backward. Now select “cut” and follow the prompts to set up your machine and cut the image. FOR IRON-ON VINYL BE SURE THAT YOU PLACE THE SUPER SHINY PLASTIC SIDE OF THE MATERIAL FACING DOWN. The vinyl itself must be facing UP or it won’t get cut. Once your machine (or your hand with scissors in it) is done cutting you will need to “weed” the vinyl by removing the excess vinyl. 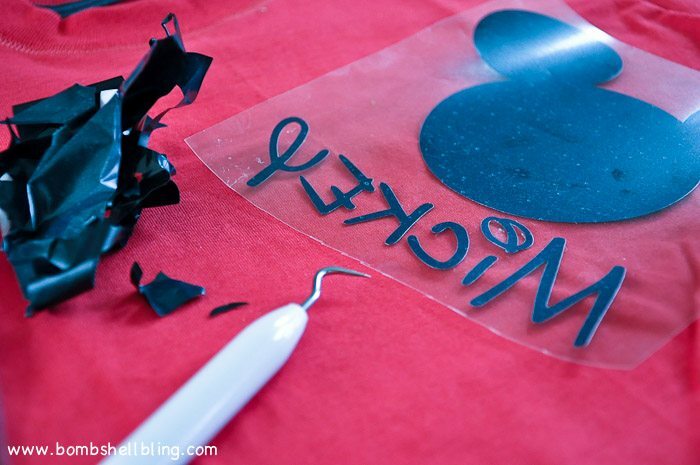 Lay the image where you would like it on the shirt and iron over the plastic with hot, dry heat. Slowly pull away the top plastic and you are finished! Ta Da! Pretty cute, huh?? Here are some shots of my boy’s shirt in action. Love him. 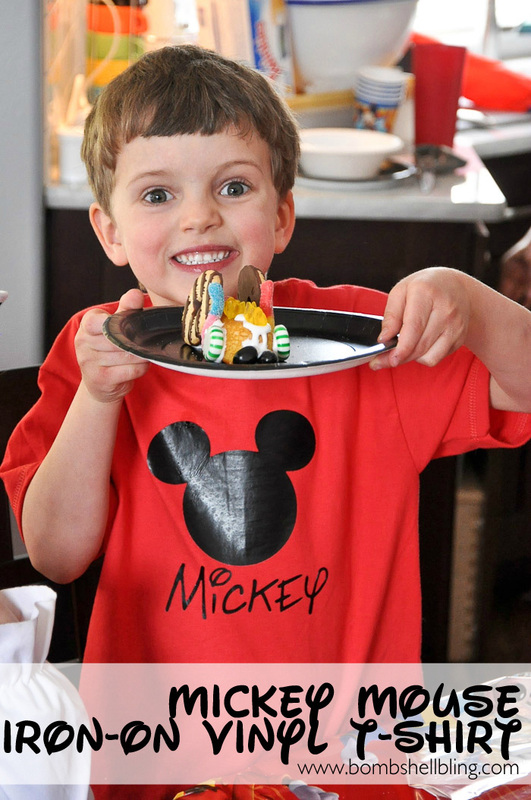 Be sure to check out the rest of the Disney Week tutorials and enter to win $150 to the Disney Store! 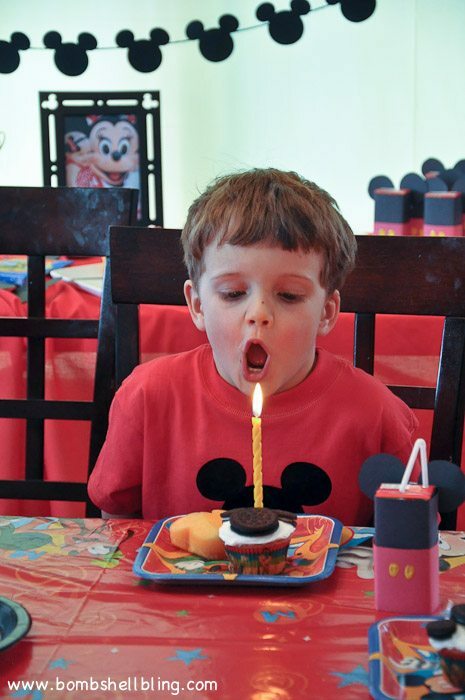 And come back tomorrow to see the FULL “Show Your Disney Side” birthday party reveal and to link up YOUR Disney ideas to the big, 8 blog All-Disney Link Party!!! Oh!!! I TOTALLY LOVE this. I want a shirt for myself!!! 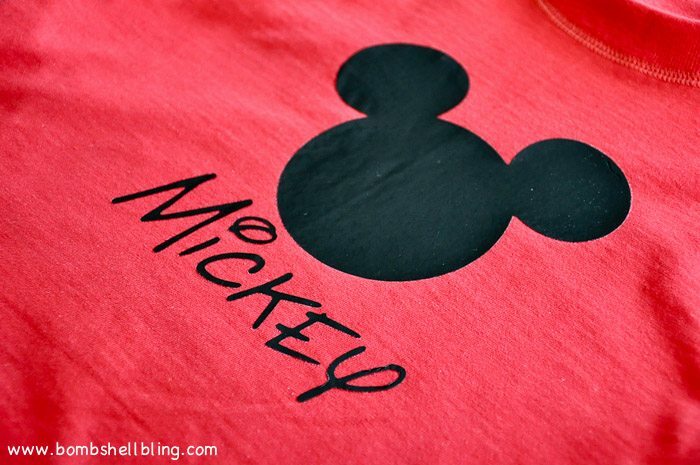 🙂 This is such a great way to personalize and have matching shirts for those Disney Adventures! Hoe easy is it to do this for other things? I want to try water bottles, but I don’t want to have to buy the machine just to do that….. It is incredibly easy with a Cricut! 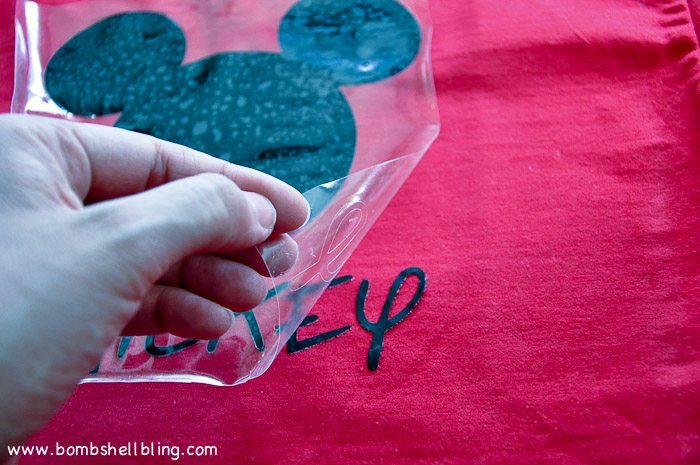 You could use vinyl and just cut out Mouse Ears for water bottles very easily, but not the name. That would be very tricky without a machine. Thanks for sharing it with us. It’s very inspiring. Go Mickey!